I love virtually all vegetables and fruits. But let’s be honest, not all fruits are worth eating. In fact, some might only be sanctioned for consumption in a post-apocalyptic-global-thermo-nuclear-war scenario. Such is the case for the following eight fruits that are simply not fit to eat otherwise. 8. Prunes – I rather enjoy plums but somehow during the dehydration process to metamorph into a prune, all the tart deliciousness gets sucked out and gets replaced with the blechy flavor of nursing home, moth balls, Geritol and Ensure. 7. Mango/Papaya/Pineapple/Akee – The very thought of any of these tropical-tasting fruits makes me throw up a little in my mouth. That involuntary reflex (or reflux) is due to the fact that I ate nearly a whole bag of tropical-flavored Starburst fruit chews as a teenager one Halloween. When I woke from the fruit-chew-induced sugar coma I couldn’t even stomach the sounds of Caribbean steel drums without regurgitating bile – let alone eat a piece of tropical fruit. 6. Pumpkin – Pumpkins (pronounced punkin by the kids in my household) belong to the pepo class (e.g. watermelon, honey dew…etc.) of fruit. Regrettably, this pepo variety is barely edible in a Thanksgiving pie and is best served smashed on the road the day after Halloween. 5. Fruitcake – While not specifically a fruit per se, there are too many possible jokes to not include it on the list. In fact, the average fruitcake is nothing more than piles of dried fruit, nuts, eggs, brown sugar, salt and a couple bottles of bourbon (copious consumption of that last ingredient seems to be a pre-baking ritual of anyone who makes this fruity-Frankenstein monster). 4. Maraschino Cherries – Fresh cherries are fine and shouldn’t be on this list, but maraschino cherries are unnaturally red, sweet, slimy and revolting. Maraschino cherries may possibly be the only fruit in existence that might actually taste better if it was eaten by a fruit bat and then passed through the Chiroptera’s digestive tract prior to human ingestion – that might help. 3. Tomato – I love tomatoes as a vegetable but not as a fruit. You don’t drink tomato smoothies, make tomato frosting nor put a cherry tomato on top of your ice cream sundae. The reality is that tomatoes actually sing with a little balsamic vinegar and mozzarella despite the fact that the Oxford Dictionary scientifically classifies tomatoes as a fruit. 2. Peach/Kiwi – While I love the innards of these produce, I hate eating fruit with an exterior that’s hairier than me – it challenges my manhood, and I don’t like it. When I slice up either type of fruit, I’m not sure if I should be using my Schick Hydro 3 blade and then top it off with a dollop of creamy Barbasol. 1. 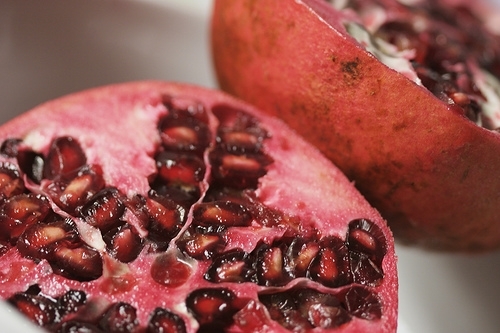 Pomegranate – Really? Have you ever TRIED to eat this piece of fruit. It’s perfectly clear to me that the pomegranate has evolved itself to NOT want to be eaten. Wrestling those teeny tiny fruit seeds from its waxing inside, is like trying to chip pieces of embedded gravel out of broken piece of concrete. Question: What other sickening fruit choices are missing from this list? I would add persimmons. They can taste pretty good if picked at just the right amount of ripeness, but too early and it’s like a mouth full of alum. Pucker up! Also the fruit of the prickly pear cactus is tricky. It also tastes fairly good, but the skin has small clusters of very tiny stickers, which are really bad for your mouth and digestive tract! okay, you took out my fruitcake and quite frankly, it is the bourbon that makes it so appealing and the maraschino cherries, well they give ice cream sundaes their pizzazz! I will give you the pomegranete. I have nothing against the seeds, but I can’t spell the damn fruit. That is too frustrating to me. Great post Tor! Durian. It is native to East Asia. I first became aware of it when visiting Hong Kong. I don’t know how it tastes, because I couldn’t get past the smell. It smells like something that died two weeks ago, after lying in a swamp for a week. People who appreciate this fruit say it has a texture like custard. I wouldn’t know. I also don’t know how anyone can even think of eating a durian, unless they were born without a sense of smell.